Rabbi Yaakov Yissochor Baer Rosenbum (“Be’er Yaakov”) Z”L, during Hachnasat Sefer Torah. I usually don’t make pictures of Rabbi’s, but this one spoke to me. Sold to a client in California in 2007. Rabbi Tzvi Hirsch Rosenbaum of Kretshniff-Sighet Z”L, playing a violin on Motzei Yom Kippur of 5766/2006. 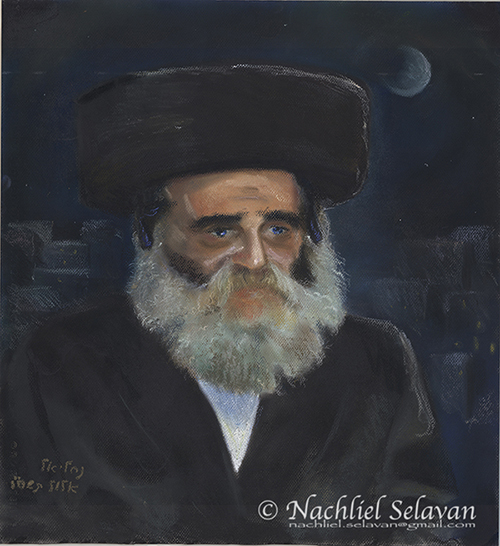 Painted shortly before he passed away, this pastel portrait was quickly purchased by a family in Rehavia, Jerusalem. צוייר זמן קצר לפני פטירתו. ציור פסטל זה נמכר למשפחה פרטית ברחביה, ירושלים.